They can’t . Because if they did, they would have to start doing something about it. A white SUV sits in the middle of the road as police and emergency personnel work at the scene where a car ran over pedestrians on Flinders Street in Melbourne on December 21, 2017. 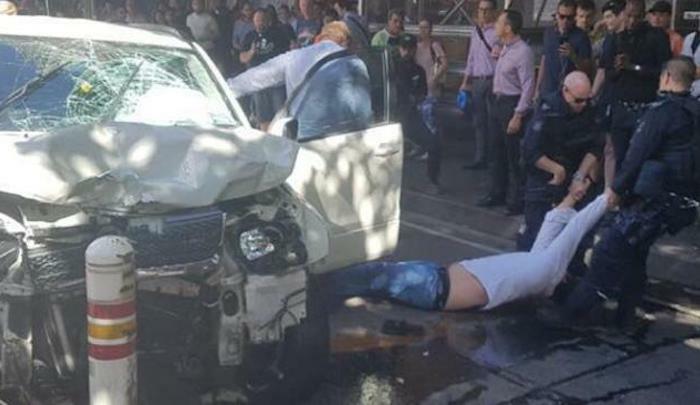 A car deliberately plowed into pedestrians injuring 19 people at a crowded intersection in the Australian city of Melbourne on Thursday, but police said they did not believe the attack to be terror-related. In January, four people were killed and more than 20 injured when a man deliberately drove into pedestrians just a few hundred meters away from Thursday’s attack. That too was not a terror attack. 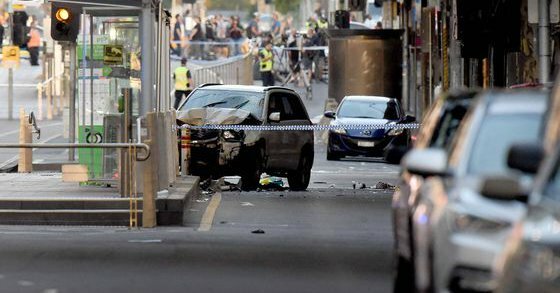 “At this time, we don’t have any evidence or intelligence to indicate a connection with terrorism,” said acting chief Commissioner Shane Patton, who added that the driver suffered mental health issues. #Melbourne cops seem very keen to downplay terrorism and emphasise mental illness of Afghan-background suspect. But no mention of religion. The helpless, voiceless mentally ill are drawn in but not the primary motivation of such alleged car attacks. Red Dan nods approvingly. Drugs have been a problem in this country since it became a country. But no drug addict has ever driven his car deliberately into a crowd of people because he was having a bad day –until now… 2 brown guys with beards, coincidently. A mentally ill drug addict. With a criminal history. Of course. How could this possibly be terrorism? Notice, however, buried deep in this report, a most interesting detail: “Second man arrested at the scene was filing [sic] the incident and had a bag containing knives.” He wasn’t filing, he was filming. What kind of mentally ill drug addict decides to drive a car into pedestrians and gets a buddy to fill a bag with knives and come down and film the act? Clearly the filming was for jihad video; we have seen other jihad terrorists, such as Mohamed Merah, who massacred people at a Jewish school in France a few years ago, film their acts so that jihadis can enjoy the bloodshed and recruit others to the cause. If Australian authorities think this wasn’t terrorism, but just more of the global outbreak of mental illness, they’re whistling in the dark. This is clearly a small scale jihadi attack, driving vehicles through crowds is their favorite tactic at the moment for these type of Jihadi’s. Other people who have mental health issues and addiction to ice, do not do this kind of stuff. It is a show of epochal wonder to see the leadership of the Western Civilisation… thinking and operating in the fog without the compass of the forefathers. Otherwise the causes and effects and what to do would be today sharp clear. It is another good news, however, this new alleged mad cow raptus has nothing to do with Father Xmas. The police have blamed this incident as being due to the perpetrator being mentally ill, before they have even obtained a psychiatric assessment and the media are, as usual, promoting this excuse based on the cops unverified assessment. A few weeks back Don Burke was pilloried by the very same media for daring to offer an unverified assessment that he had Aspergers Syndrome and that this (partly) explained how he would express his vulgarity in inappropriate cicumstances, i.e. not in the locker room or down the back of a bus but in front of old ladies in their garden or in front of Jessica Rowe on TV. Further articles featured people from Aspergers support organisations excoriating Burke for having gall to impugne this whole class of people by association. Well here are the cops impugning the mentally ill once again yet where are the articles decrying this slander and why is the media not reporting spokespeople from Lifeline and Beyond blue, Headspace etc as being outraged at the cops making the mentally ill the scapegoat for this event . Where are the articles decrying this attack on the mentally ill and calling for it to cease, lest it promote a backlash against them? The lies are starting to wear thin.